Hitting an ace, or a hole-in-one, involves equal doses of skill and luck. An ace is golf is a rare, exciting feat. To hit the golf ball into the hole in just one shot requires the right mixture of skill and luck. Some professional players have never hit a hole-in-one, while many amateur players have. Generally, aces occur on par-three holes because par-four and par-five holes are too long. Only two people have made a hole-in-one on a par-five, according to the United States Golfer Registry. Michael Crean did it in 2002 on a 517-yard hole in Denver, Colorado. Edward Morrison made his in 2007 on a 440-yard hole in Henderson, Nevada. An ace in golf means hitting a hole-in-one, or taking only one stroke to get the ball from the tee into the hole. This type of shot requires perfect accuracy and direction. Golf holes range between par three and par five, meaning it should take three, four or five shots to get the ball into the hole. To even think about a hold-in-one, a golfer needs to take into account wind, hazards and length--and then hit a perfect shot. The term "ace" comes from the name Ace, which is generally a boy's name and derives from Latin. Ace means "a very skilled person" or "a person who excels at something," according to the Merriam-Webster's Dictionary. To hit an ace means the golfer has excelled at mastering that hole. The oldest person to ever hit a hole-in-one was Harold Stilson, according to the United States Golf Registry. He got the ace in 2001 at age 101, using a four-iron. He aced the shot on the 108-yard 16th hole at Deerfield Country Club in Brockport, New York. Norman Manley reportedly hit 59 holes-in-one in his life, the first coming in 1964. A blind man, Joel Ludvicek hit an ace when he was 78 years old on the 178-yard 11th hole at Twin Pines Golf Course in Cedar Rapids, Iowa. He made an ace earlier in his life, but this was his first since losing his vision. Michael Crean his a 517-yard ace on the par five ninth hole in Denver, Colorado's, Green Valley Ranch Golf Club. 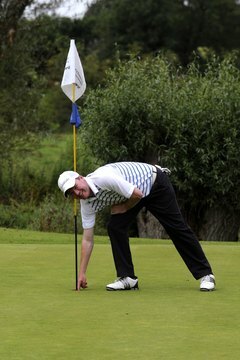 Golfers can report an ace to the United States Golf Register, whose mission is to record every hole-in-one in golf. Golfers must be playing on a course with at least nine holes. They can only be playing with one ball, and not in a practice round. They must have a witness or be deemed acceptable by the Golf Register Committee, and must hit from a temporary tee to a hole on a putting green. When reporting the ace, the golfer must also include the location of the course and the length of the hole. According to the United States Golf Register, the odds of hitting an ace are one in every 33,000 swings. The average score for a male golfer is just over 100 per 18-hole round. This means, on average, a golfer would scores an ace every 330 rounds.